A natural blend of Essential Oils & Natural Extracts, to increase the quality of hair and maintain the colour pure. The unique blend of herbs including Bay Rum extract and Rosemary and Bergamot oils all work in conjunction for lush and healthy hair. 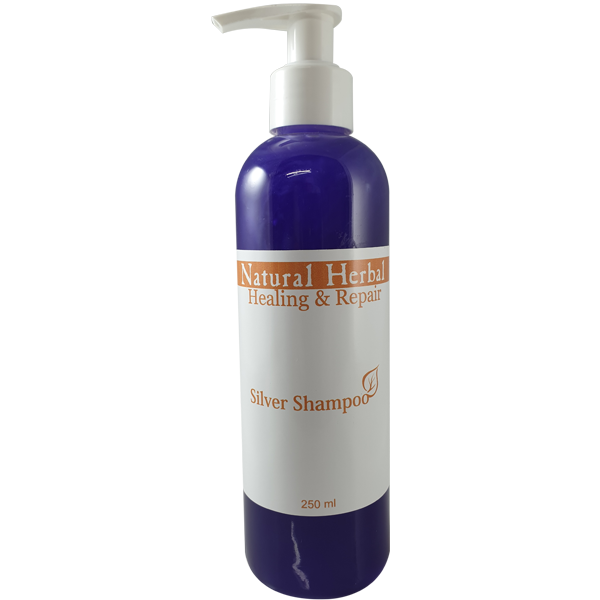 Healing & Repair Range Silver Shampoo contains Bay rum which is known to trigger contractions in muscles and tissue fortifying the scalps hold on hair roots, thereby reducing hair loss. With added Hydrolysed Wheat Protein, it strengthens the hair follicles and smoothens the hair strand and through this action reduces breakage. Wheat Germ Oil has also been included as it improves the health of the scalp, which in turn produces healthy hair strands. It also improves the volume of the hair, giving a fuller and more lush appearance. With natural Jojoba Seed oil, hair loss is reduced by enhancing hair growth through the stimulation of hair follicles. It also cleans out the hair follicles by dissolving the sebum and other debris, giving the hair a smooth clean follicle which in turn enhances the health of the hair. Additional Bergamot oil has a stimulating effect on the scalp, increasing blood circulation resulting in more nutrients being transferred to the hair follicles which in turn strengthens the hair. Rosemary leaf oil has a stimulating and soothing effect on the scalp while also increasing the blood flow to the hair follicles. It is a great antioxidant reducing the damaging effects of tough chemical treatments and modern day city living, strips all the product build up on hair leaving the hair smooth and shiny. Gentian Violet adds the benefit of reducing the yellow colouration of the hair strands after the treatment of bleaching. Apply to wet hair and massage onto the scalp. When it has lathered well, rinse off and follow with Healing & Repair Silver Conditioner. Fresh clean scented hair with a soft, smooth & shiny appearance. Reduces discolouration of naturally blond as well as treated hair.